This is a jar of orange marmalade that we made over the weekend. The simple reason why we made it? We were in a jam. 🙂 We had run out of jam and jelly in the house and I needed something to go with the toast and peanut butter that I eat in the morning. I have had this recipe for a long time, but never made it. It is another recipe from one of my favorite chefs, Anna Pump. She made it once a year at her store ‘Loaves and Fishes’ in the Hamptons and people signed up on a waitlist to get their share. She finally published the recipe in one of her cookbooks. 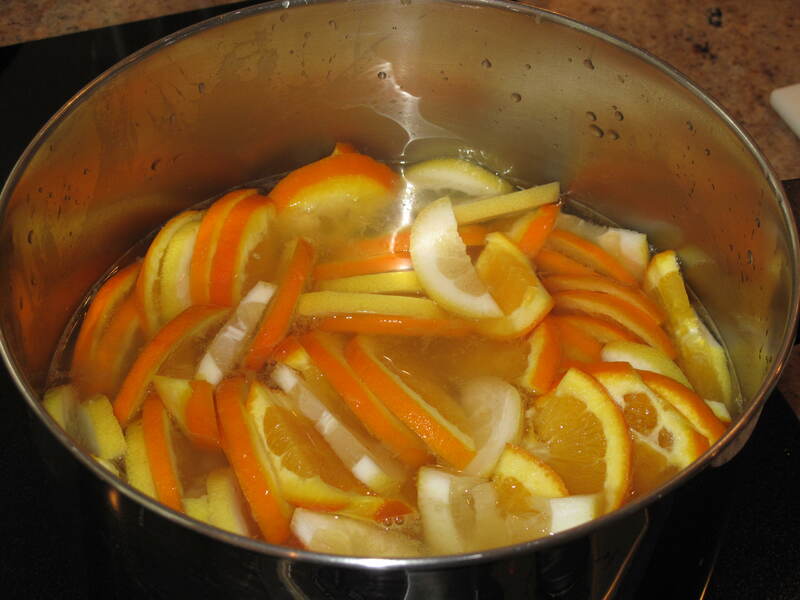 When we ran out of jam and jelly, we didn’t have strawberries or blueberries in the house, but we did have oranges and lemons, which was my indicator that is was time to try the marmalade recipe. Along with the oranges and lemons, you also need sugar. Sugar is a staple in almost all jam, jelly and marmalade recipes. I have read many times that the art of jam, jelly and marmalade making is knowing when the sugar has cooked down to the right consistency. I think that there is a lot of merit in this statement. Even though this recipe stretches out over two days, it is really easy. I actually used a canning pot and gave my filled jars a water bath so that they would seal and last longer. 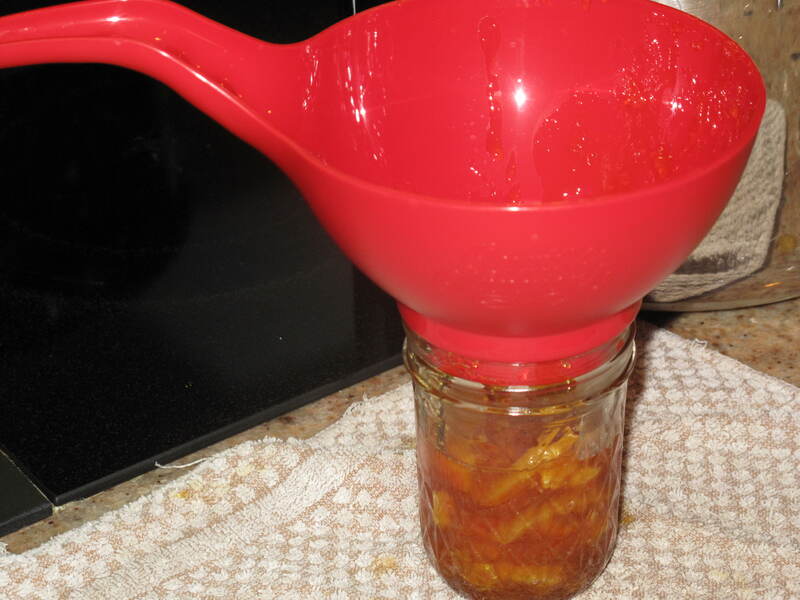 Using this method means your marmalade will last about 1 year. You can also fill the jars and put the lids on them. Once you do that, you can turn them upside down and let them semi-seal. If you use this technique, the marmalade will only last about 3 months. There is something so delicious about marmalade with little chunks of orange and lemon rind laced in it. I have already tried some of my marmalade and it is well worth the effort. 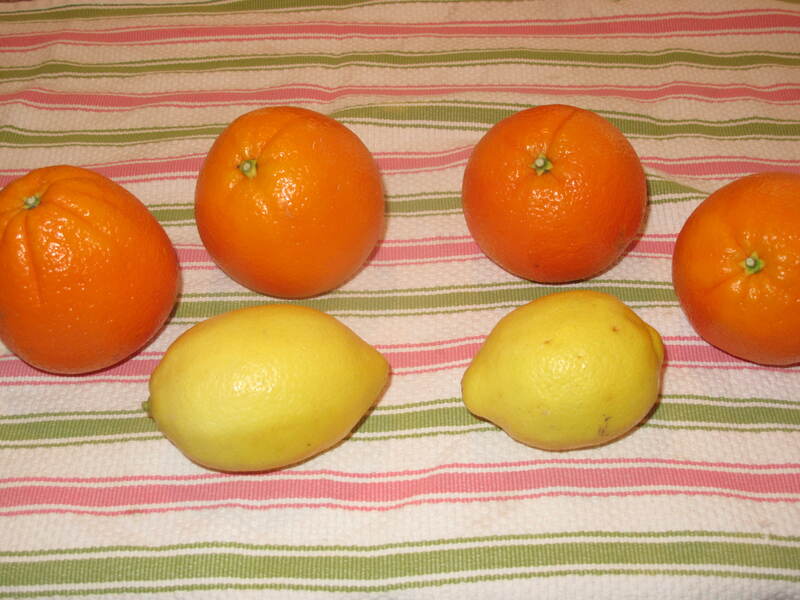 Cut the oranges and lemons in half crosswise, then into very thin half-moon slices (if you have a mandoline, this will be quite fast). Discard any seeds. 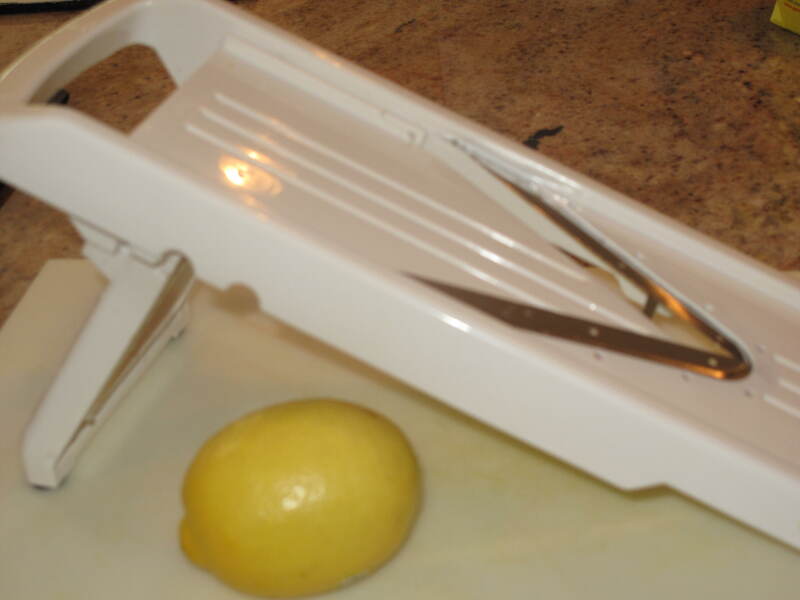 Place the sliced fruit and their juices into a stainless steel pot. Add 8 cups water and bring the mixture to a boil, stirring often. Remove from the heat and stir in the sugar until it dissolves. Cover and allow to stand overnight at room temperature. The next day, bring the mixture back to a boil. Reduce the heat to low and simmer uncovered for about 2 hours. Turn the heat up to medium and boil gently, stirring often, for another 30 minutes. Skim off any foam that forms on the top. 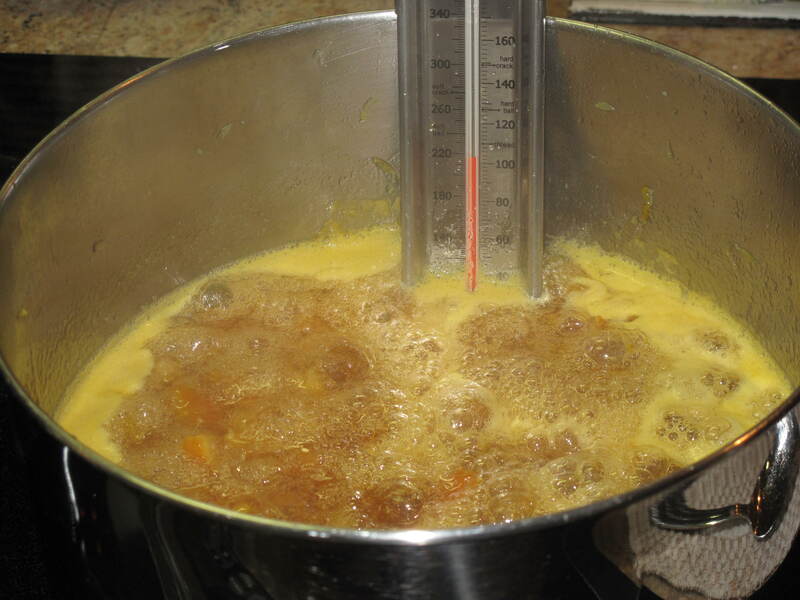 Cook the marmalade until it reaches 220 degrees on a candy thermometer. If you want to be doubly sure it’s ready, place a small amount on a plate and refrigerate it until it’s cool but not cold. If it’s firm (neither runny nor too hard) it’s done (if the marmalade is runny, continue cooking it and if it’s too hard, add more water). The marmalade will be a golden orange color. 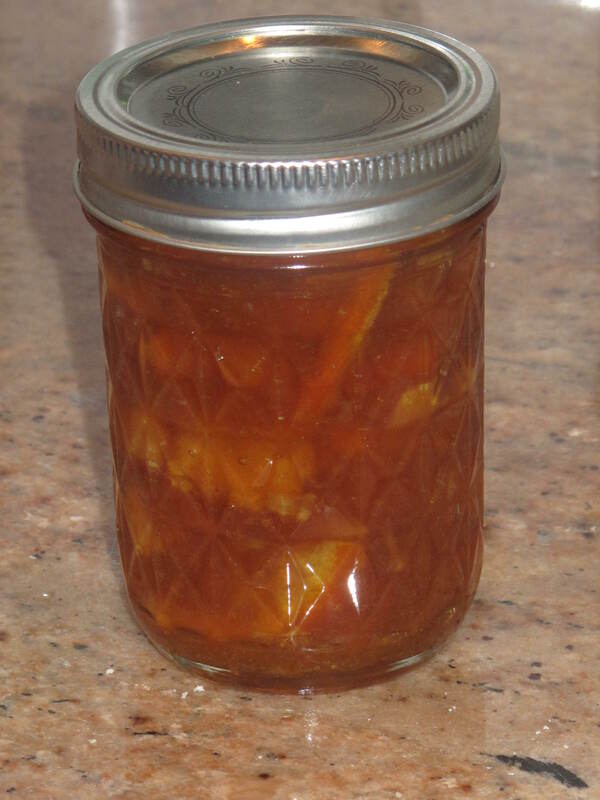 While the marmalade is cooking, make sure that your Mason jars, lids and caps are clean and that they are very hot at the point you are going to fill them with marmalade. 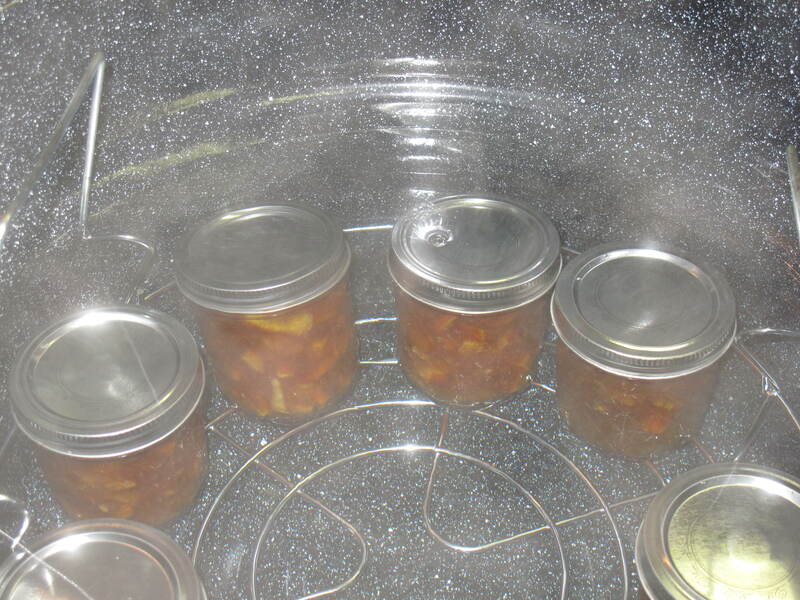 They must be hot to ensure that food bacteria will not grow and ruin the marmalade or make you sick. The best way to get the Mason jars hot is to put them through a complete wash and dry cycle in the dishwasher without using any soap. Pour the marmalade into the clean, hot Mason jars and wipe the rims thoroughly with a clean damp towel and then attach the lids. 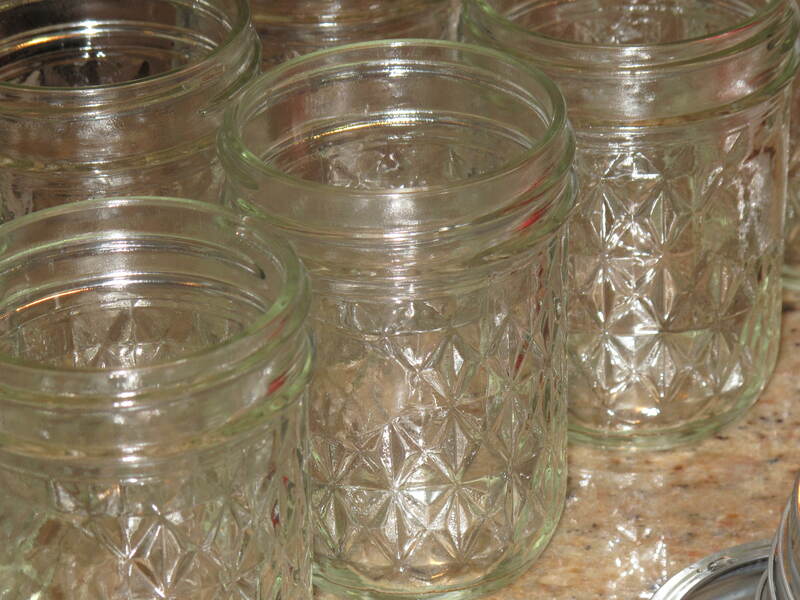 Place jars into a canning pot filled with boiling water about 1 to 2 inches above the top of the jars. Boil in the water for 10 minutes in the covered canning pot. Remove jars and allow them to cool and seal. The top of the lid will not pop up and down if the jar has properly sealed. Store in the pantry for up to a year. The recipe actually made nine 8 ounce jars of marmalade and a little bowl that we kept for immediate eating. It was really great. I will tell you that 8 cups of sugar seemed like quite a bit of sugar to me when I first read the recipe, but I did not find the finished product too sweet. Use your judgement if you think you would like it a little less sweet and reduce the amount of sugar to 6 or 7 cups. It will still taste great. The best part is that we now have enough marmalade to last us through the rest of the Summer and well into the Fall and Winter when marmalade tastes even better for some reason. The jars can also be decorated and given as gifts. Have you ever made homemade jam, jelly or marmalade and what kind is your favorite? This entry was posted in Food and tagged Acorns, Cooking, Family, Food, Fun, Life, Lifestyle, Love, My Life, Photos, Recipes, Summer, Thoughts. Bookmark the permalink. Looks fantastic. The store stuff is way too sweet. Hi. When I saw 8 cups of sugar for this one I thought it would be too sweet as well. Much to my surprise, it wasn’t. I’m with you on the store bought marmalade. Come back and visit soon. It looks delicious. I love jams and jellies with a tart taste. Is this a little tart or is it really sweet? Either way just by the look of it I would eat it. Hi Carolkin. The marmalade is more on the sweet side, but really delicious. You would like it on some toast along with some peanut butter.